Post-game at Expo/Vermont Station. Photo: Metro. Fans headed to the game Sunday morning. Photo by Gene Lui, via his Twitter feed. 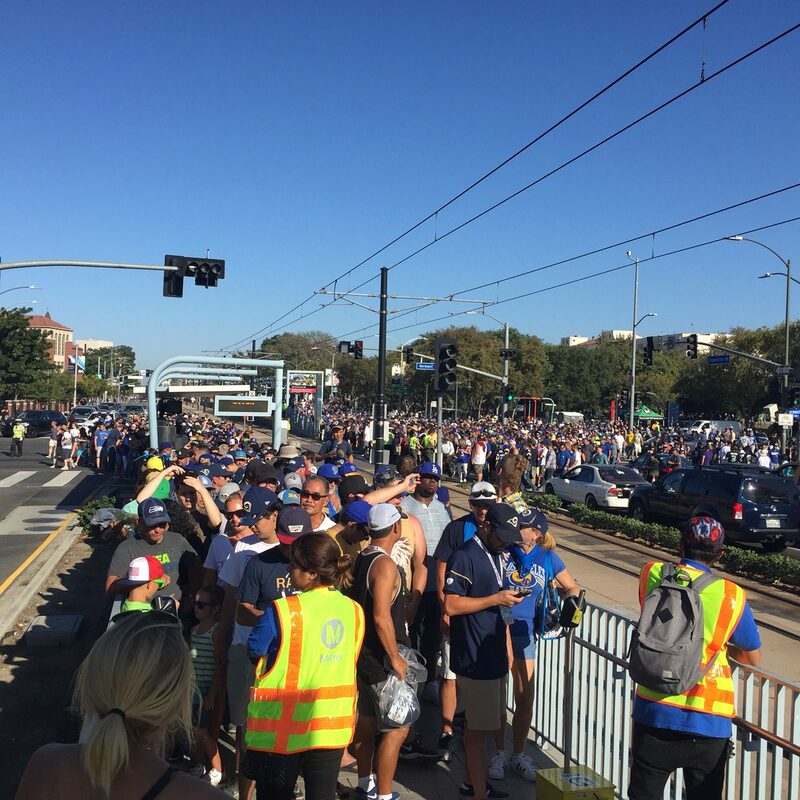 We knew ridership to the Rams thumping of the Seahawks was big with Metro estimating about 21,000 boardings on the Expo Line and Silver Line after the game. The NFL is saying that 91,046 tickets were distributed to the game, although actual attendance was 80,147, according to the Los Angeles Memorial Coliseum. That means about 26 percent of those who attended the game left on Metro. It’s the most crowded anyone at Metro can remember seeing the Expo Line after a football game — and the Expo Line has been running to USC games since the 2012 season. We’re aware there were long lines after the game. The Rams sealed the win in the final minute of the game, resulting in a huge crush of people leaving the Coliseum at the same time. It took about 85 minutes to get most of the crowds on trains after the game with a short delay in Expo service due to a power-related issue. Of course, this is also the first football season with the Expo Line extension open to Santa Monica and it’s easier to get to the game via rail from more places. Metro also offered extra Silver Line service and Metrolink ran some extra trains. 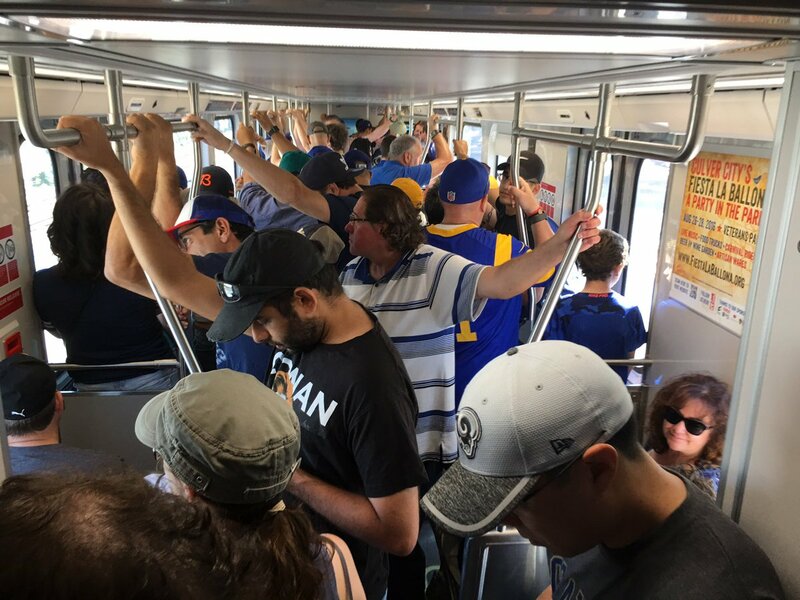 On our system, Expo trains were very full from 10 a.m. until the 1:05 p.m. game time. By noon, parking lots were filled at Culver City Station and La Cienega/Jefferson stations on the Expo Line and the North Hollywood and the Universal/Studio City stations on the Red Line subway. What did you think, fans? Anything we should do different before the Rams host the coming-apart-at-the-seams Buffalo Bills on Oct. 9? Anything you would do different? Comment please or pass me an email. @brittny_mejia @metrolosangeles ridiculous pricing. #metro is the winner here. I expect there will be, at the least, shuttle bus service between the Crenshaw/LAX Line — scheduled to open in 2019 — and the new stadium. @ayogist @expolineledger @metrolosangeles @RamsNFL so proud of LA Metro wish this was done when I moved to LA than it was only cars. @metrolosangeles you guys need to prepare for these Ram games way better than it's being done today! If you’re religious, can you please pray to your god to give the Rams a touchdown? Two games and no touchdown ain’t good! Not so much regarding service to the Coliseum, but with service to the new stadium. You gotta have the closest metro rail stop to the new stadium be closer than 1 mile. The challenge is that plans for the Crenshaw/LAX Line were finalized and construction was already well underway when the Rams and NFL decided to move to Inglewood. Metro will be doing a study of a possible Green Line extension to the stadium, but at this time there are no firm plans about that. I think the issue here was that over the last several years, there have been competing sites for an NFL stadium. It was only in the past couple of years that the list was narrowed down to Inglewood and Carson. These were not chosen by government entities — rather by land owners or NFL owners. As much as I would like to see rail service to all NFL stadiums, I don’t think it would have been a good use of public money to begin very expensive environmental studies for rail lines to serve each of the possible stadium sites. Because there are so many cities in the county, we also didn’t have one public official or agency that could dictate where a stadium absolutely had to be. The Inglewood site may not be ideal, rail-wise. But I think a shuttle between the Crenshaw/LAX Line and the stadium could work fine. There are thousands of public transit buses in our region. Many other big events — in particular the Indy 500 — get people to and from the event using buses. They do so cleverly, with bus lanes, designated streets for travel and a system that they have honed for years. There is no reason the same couldn’t happen here, with buses leaving from across the region — including rail stations — to reach the stadium. After all, the Hollywood Bowl bus system works pretty well. Traffic is already a nightmare in and around where the stadium is being built. During the holiday shopping season it is even worse. I cannot imagine what the new stadium will do to the area traffic wise without a more directly connected transportation system to the stadium. I live in the area and avoid it due to the nightmarish traffic. Yep, the Rams took Inglewood over Carson. All that had to be done is reroute Silver Line BRT buses to a stadium there. Remember we had the crowded Forum and Hollywood Park race track with its crowds. I remember how LATL had shuttle buses between the 5-car and Hollywood park. The key was they queued trains on one track and single track the other trains between Arbor Vitae and Century. This is something that could be done also on the Expo Line. With modern technology this should be no problem. Hopefully there will be an elevated people mover between the Inglewood stop and the new stadium.This would be a win-win for all. However I do not expect to see one since it would interfere with parking revenue. Only if the lots fill well before the games can we hope for a people mover or something similar. 8 days a year, 7 of them Sunday afternoons. Doesnt seem TOO bad. Agree. Thus, there should be a line to Dodgers stadium, 82 plus events a year. Considering that an average NFL stadium hosts 15-20 events a year, I’m happy with the county not spending billions of dollars building a line specifically to a new stadium that will otherwise see very poor ridership. There was in adequate queuing space at the Vermont station post game. We opted to take an Uber rather than wait in the middle of a busy intersection for who know how long until the trains could load us. I wasn’t at the game, so I can only use the reactions in the article to make my ridership estimate: 11,000 round trips on Expo, (i.e. 22,000 boardings). The article above states that the Expo Line “trains in both directions were pretty much filled from 10 a.m. until the 1 p.m. game time on Sunday — with trains running every six minutes in both directions”, which is 180 minutes from 10 a.m to 1 p.m. . Then how was Metro able to move that same amount of viewers of the football game in only 83 min. on the Expo Line when the game ended? Was it due to more train cars and or more frequent service? An obvious improvement in moving this many people in a shorter amount of time when the next home game happens would be to have lots of buses available. The 2005 opening day of the Orange Line, when rides were free all day, Metro had Rapid and Orange Line 60-foot buses available. Drivers lined up the buses on the street. After one bus had filled with passengers and left, the next one would line up for passengers. Running buses frequently shouldn’t cause a traffic jam if its a Sunday game. There was also supplemental bus service to help the Expo Line after the game. I think Metro failed in not making the stations longer capable to extend to more cars as Bart Reed from The Transit Coalition had suggested. Over time the Expo line will become one of the busiest lines in LA. Dennis: “Pretty much full” probably means all of the seats were filled. A 3-car Expo train has around 200 seats. After the game I’m sure that every train was packed to the gills, which from my commuting experience means 400-500 passengers per train. This is how they could clear the platforms in half the time (85 minutes vs. 3 hours). How much of the 85 minute delay was due to the power failure, and how much of the delay would have occurred even without the power failure? I’d like to point out that there is no Red Line station at the Hollywood Bowl because everyone leaves at once, and that’s just not compatible with train service. How is that different from football games at the Coliseum? I can’t agree with you more Lincoln. Why didn’t they design a station at the Hollywood Bowl? It would of dramatically reduced the traffic big time. At times when the Hollywood Bowl isn’t in session you could use their parking lot as a park and ride lot especially designed for the area giving free parking. The stations around the LA Coliseum serve USC every day all day. The Hollywood bowl is completely vacant when not in use. Much less reason to spend hundreds of millions of public tax money providing rail service. Re: connections to the new Inglewood L.A. Stadium, many of the suggestions are good, but in the interim, consider using articulated buses similar to the Orange Line shuttle fans between the Crenshaw Line and the new stadium. They already have overhead reversible lane signs on Prairie Ave. and can reserve those lanes for bus use only. Metro, please do the same for Halloween weekend and extend train service beyond 2 am to accommodate the drunken crowds. Every year we can’t understand why Metro stops running the trains at 2 when you know people are out partying and drinking every year. Just like New Year’s Eve… known party/drinking evenings. Thanks! Boo Hiss on the MTA for not planning well. They should have anticipated the Rams moving back to Los Angeles and get wind that they would be at the old Hollywood park area’s new stadium and work with the developers. YOU’VE GOT TO BE ONE STEP AHEAD AT ALL TIMES! I would love to see that the new stadium’s parking lot would be a park and ride having a light rail station there.They just don’t plan like when you’re making a party-expect more than you ordered. There are not enough cars in a string of light rail cars for this line when a game is playing at the coliseum maybe 6 at the most. They have to learn this from NYC as the average subway string of cars can be as long as 12 cars-enough room for every body. LACMTA plans like they think they’re in El Paso Texas. My open letter here to the LACMTA start right now and plan transit correctly, expect more than usual and you’ll do better. Don’t be afraid to elongate the platforms and add more cars and frequencies. Don’t operate the trains at 10 minute intervals. When there are events anywhere, operate the trains in 3 minute intervals. More trains, and shorter times between. Wow, 21,000, that’s impressive! Do you have separate counts of how many riders rode each route (Expo and Silver Line and the “supplemental bus service to help the Expo Line”)? To get more people to vote yes on Measure M, Metro needs to show comparisons of how many people can be moved on the Expo light-rail line during peak hours compared to mixed use lanes on the 10-freeway. The amount of boarding’s the Expo Line had in less than 90 minutes after the Rams game could be another way to dramatically illustrate this. 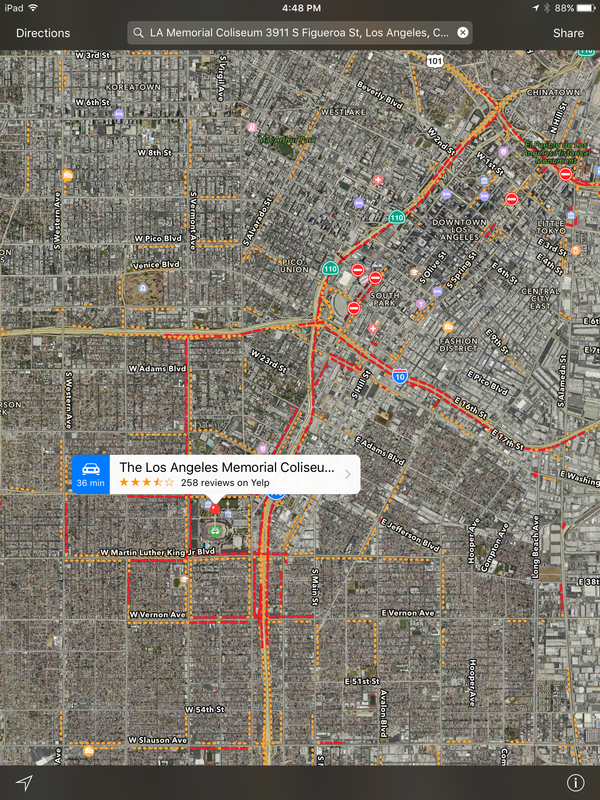 The Expo line costs less than 1/5 the cost of a 10 lane freeway? Why should the be compared. Even if a freeway would have been better, do you think any neighborhood in LA wants another 10 lane freeway torn through it? Even so the problem wasn’t the highways. Look at the graphic, the 110 looks relatively open on game day. The problem is the local streets and the parking. Another 22000 cars on those streets(which are plenty wide) wouldnt help and would make parking even more expensive. When Metro has more cars next year, would the 6-minute intervals be shortened? What would be the minimum interval if Metro had all of the new cars? I don’t want to rule it out, but I can’t say more than possibly. It depends on equipment availability, manpower availability, budget, ability to get Blue and Expo trains turned around quickly at 7th/Metro and working with the city of L.A. to coordinate train movement through the intersections. It was briefly discussed at today’s post-game meeting and it was clear that likely will not be happening soon. Also discussed was using more supplemental bus service/shuttles. Steve: The best solution is man both sides of the cars with operators. On the going the operator on the end cars gets a break and the forward operator would be in charge and operating at the end of the line the duties switch off making turn around very quick. On the Blue Line exception is that when you’re in Long Beach the forward operator would keep in command until returning to 7th st/Metro center where the duties would switch and the rear operator would get a 2 hour break. This could be done on all rail lines to speed up the turn around times instead of allowing the operator to exit their cab to go on bathroom breaks and on this topic I would suggest bathrooms for operators on all stations. With all this you would be able to turn around a train in no time. Metrolink trains ought to be set that there should be an engine lead car on both ends and having my idea would turn around a Metrolink train much faster as well. On what you wrote about equipment, manpower, and budget availabilities all I have to say to LACMTA is ((DO IT!!!)) DON’T BE AFRAID TO IMPROVE SERVICE-THIS HAS BEEN THE PROBLEM OF LACMTA IS YOU’RE TOO MUCH AFRAID TO IMPROVE SERVICE WHERE IT IS STRONGLY NEEDED, IT’LL PAY OFF RIGHT IN FRONT OF YOU. AGAIN STEVE: LACMTA MUST PLAN THE SERVICE JUST LIKE A PARTY-EXPECT MORE THAN IS EXPECTED-DON’T BE AFRAID-IF YOU GUYS DON’T WANT TO DO WHAT IS EXPECTED OF YOU-GIVE YOUR POSITIONS OVER TO THOSE THAT WOULD IMPLEMENT MY IDEAS IN A HEARTBEAT. THIS IS THE REASONS WHY L.A. IS SOO BEHIND IN TRANSIT WITH THE REST OF THE COUNTRY. STEVE: THE CRENSHAW LINE IS A TRAVESTY. THE GREEN LINE TRAINS SHOULD BE GOING ALL THE WAY INTO LAX BY ITSELF WITHOUT ANY AIRPORT PEOPLE MOVER. WHAT YOU DO IS GET THE GREEN LINE INTO LAX IN IT’S HORSESHOE DESIGN AND HAVE TSA AGENTS CHECK EVERYONE ENTERING THE AIRPORT AND BEYOND THE TSA WOULD BE ANOTHER PEOPLE MOVER FOR THOSE CONNECTING TO OTHER TERMINALS AND FLIGHTS WITHOUT LEAVING SECURITY (MAKING IT CONVENIENT). TAKE THIS SPUR OF THE GREEN LINE UP TO AND HAVING A STATION AT LMU, MARINA DEL REY, VENICE BOARDWALK, AND HAVE A SUBWAY MULTI PLATFORM STATION RIGHT UNDER THE 3RD STREET PROMENADE ACCOMMODATING THE EXPO LINE AND FUTURE PURPLE LINE EXTENSION. I WOULD EVEN CONTINUE THE GREEN LINE FROM THE 3RD STREET PROMENADE SUBWAY STATION NORTH HAVING STATIONS AT PACIFIC PALISADES, GO THROUGH THE HILLS TO THE WEST SAN FERNANDO VALLEY STOPPING AT WARNER CENTER, TOPANGA PLAZA, SHERMAN WAY, ROSCOE BLVD ENDING AT THE CHATSWORTH METROLINK STATION. IF VENTURA COUNTY WANTS TO FUND IT THEN EVEN CONTINUE THIS LINE TOWARDS SIMI VALLEY, REAGAN LIBRARY, MOORPARK. I WOULD ALSO HAVE A SPUR FROM THE AVIATION STATION OF THE GREEN LINE GOING THROUGH THE SAME LAX STATION THEN LMU, FOX HILL MALL, HUGGING THE CENTER LANES OF THE 405 HAVING STATIONS AT ALL THE MAJOR INTERSECTIONS (VENICE BLVD, EXPO LINE INTERCHANGE STATION, SANTA MONICA BLVD, WILSHIRE BLVD( AT THIS STATION A SEPARATE PEOPLE MOVER WOULD TAKE YOU INTO WESTWOOD VILLAGE AND UCLA), GETTY MUSEUM<WHEN OPEN, SKIRBALL CULTURAL CENTER>NOTE ON THIS: AT THE SKIRBALL CULTURAL CENTER THERE IS A PARK AND RIDE LOT ON THE OTHER SIDE OF THE 405 THIS COULD BE USED OR EVEN A MULTI LEVEL PARKING LOT WOULD BE BUILT HERE AND IF THE MUSEUMS ARE CLOSED BUT YOU HAVE YOUR CAR THERE OR SIMPLY SOMEONE’S WOULD PICK YOU UP YOU COULD SIGNAL THE TRAIN OPERATOR TO STOP GIVEN ENOUGH TIME<< THIS TRAIN WOULD CONTINUE TO HAVING STOPS ON VENTURA AND SEPULVEDA BLVDS CONTINUING EAST ON VENTURA TO VAN NUYS HAVING NEXT STOP AT VAN NUYS AND VENTURA THEN HAVING STOPS GOING NORTH ON VAN NUYS AT MAGNOLIA BLVD, BURBANK BLVD, OXNARD(TRANSFER TO THE ORANGE LINE), VICTORY BLVD, VANOWEN, SHERMAN WAY, SATICOY(TRANSFER TO METROLINK AND AMTRAK), ROSCOE BLVD, NORDOFF, PLUMMER, ENDING AT THE SAN FERNANDO/SYLMAR METROLINK STATION. SO FAR LAX IS 300 YEARS BEHIND A LOT OF OTHER CITIES IN THE U.S AND THE WORLD BY NOT HAVING A 1 TRAIN METHOD GETTING FROM THE AIRPORT TO DOWNTOWN. HOW MANY PEOPLE DO YOU THINK WOULD TAKE LACMTA'S METHOD OF GOING FROM THE AIRPORT TO DOWNTOWN LA. USING THE LAX PEOPLE MOVER, CRENSHAW LINE, EXPO LINE CONNECTIONS? YOU'VE GOT TO GO TO CLEVELAND, CHICAGO O'HARE, NEWARK, KENNEDY, ATLANTA, MIAMI, SEATTLE, VANCOUVER, PORTLAND OREGON TO TRY 1 TRAIN SERVICE FROM THEIR AIRPORTS TO THEIR DOWNTOWNS. Oh, I almost forgot you have to come to where I live now BALTIMORE. Keep in mind that starting in the spring of 2018 there will also be the 20K LAFC soccer fans every weekend. In the fall there might be sporting events scheduled on the same day as either USC or the Rams. How many riders used Expo the Saturday before for the SC game? I did, and I almost regretted it until I realized the game was Sunday. The only thing upsetting about the round trip was that on the way back to Downtown I was stuck riding on a 2-car train instead of 3. Other than that, it seemed busy as usual. Correct me if I’m wrong but wasn’t one of the Proposed Rose Line routes (yup, I saw the term rose used during the early days as well), was having an LRT option along Priarie but the option pretty much was quickly shot down because building underground next to a cemetery is a cultural no no?? Had this option actually been chosen, problem solved. But I can understand why this option was phased out quickly. That being said, I think it is completely possible to build a small rail line serving inglewood including the Crenshaw area, Hollywood Park, The Forum and the Inglewood transit center area before terminating at the La Brea station. At the very least create a BRT Line that will connect both the Green Line and Crenshaw Line with connections to such areas so that way the line will still be used even during non-game days. I just really hope the whole Dodger Express idea doesn’t come into play with this stadium. Sure it’s perfect for game days, but during other Non-Dodgers events, what exactly are the options to get there from Downtown or elsewhere??? I think Prairie was looked at as part of an early Crenshaw/LAX Line study. The Board asked for a study about connecting the stadium to the rail system, so that will burp forth at some point. I should think that anyone who has worked at Denver’s RTD would know about this. Steve, is there anyone at LA Metro who has previously worked at Denver RTD?? I’ll have to check on that. For the current Rams location, Metro should push use of the Silver Line a little more (and perhaps increase the frequency). It’s a slight premium over the regular fare, but with a (still awkward to buy) Day Pass it may be a wash. 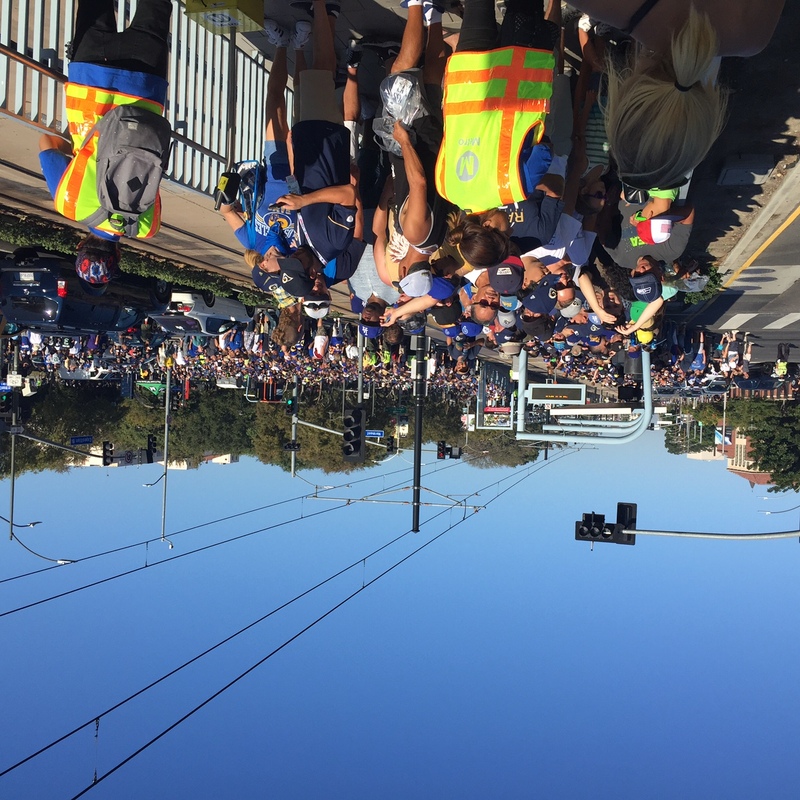 Seriously, if you can afford a Rams ticket the Metro fare is noise …..
At the new Inglewood stadium, I still believe that frequent bus shuttles on dedicated Prairie Ave lanes would work well. Run them in a loop between the Crenshaw/LAX Line and (even before that opens) the Green Line Hawthorne station.